Sample Kobo (さんぷる工房) is a factory which produces fake foods. It is located in Gujo, Gifu. Their studio is open so that you can see making fake food. At the store section, you can buy fake food for your gifts. 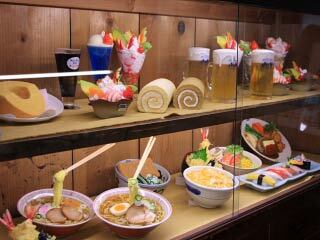 Not, only gifts for your souvenir, you can buy real fake food which you can display show window at your restaurants. Tempura, Ramen, Sushi, Beer and other are look real. Also, Sample Kobo has an experiencing making fake food. You must make a reservation. 2. use local bus to downtown. Gujo is the birthplace of Food Samples, a.k.a. Fake Food. The building of Sample Kobo is over 150 years old traditional Edo Style house. Free looking on the fake food studio. Gift shops, which sales both souvenir and real fake food for restaurants.